Acadian Genealogy Homepage; Pisiquid, Acadia! Acadia (Falmouth, Nova Scotia), is Discovered! In the summer of 1996, several skeletal remains (human remains) were unearthed while workers were excavating to construct a home on Gabriel Road in the Mountain View Subdivision of Falmouth, Nova Scotia. An archeological survey and assessment of the site, discovered signs of several graves and the remains of wooden crosses, and it was determined that the cemetery is an historic site of great importance, and is believed to be the cemetery of "la paroisse de la Sainte-Famille de Pisiquid) that was located next to the church during pre-expulsion Acadia. The cemetery, abandoned after the expulsion, is believed to have been used before the church was built in 1722 and that some of the graves may date back to as early as 1865. "La paroisse de Sainte-Famille de Pisiquid" is the church where a lot of the Louisiana Landrys' ancestors attended Mass, were baptized, married and were buried. As you know, most of the Acadians from the Minas area, and Pisiquid in particular were transported to Maryland on October 28, 1755. And after spending about 11 years in exile in Maryland, emigrated to Louisiana during 1766 and 1767. This means that a considerable number of the Louisiana Cajuns have a direct connection to "la paroisse de la Sainte-Famille de Pisiquid", where their ancestors worshipped, were baptized, married and were buried in the recently discovered adjoining cemetery. Not far from the cemetery site is the site of Fort Edward, where their ancestors were detained, and later deported; the dykeland, where their ancestors toiled in their fields and tended their livestock; and the countryside of Falmouth, where their ancestors lived, gathered wood and hunted game. One of the goals of this committee is to preserve this site and the other rich historic landmarks of the area and build an awareness about Nova Scotia history. Plans are to create "a cultural tourism trail" featuring these precious historical treasures and enhanced by the proximity of the Grand Pré and Fort Edward National Historic Sites. The committee for the preservation of the Sainte-Famille Cemetery has worked diligently to protect this burial ground and preserve this religious site of significant historical value. In order to achieve this, we have purchased the land. The site of the Sainte-Famille Cemetery has now been purchased by the committee and the site needs to be suitably developed as a memorial. Money has been borrowed for the purchase of the cemetery site and the Committee for the Preservation of the Sainte-Famille Cemetery is conducting a fund-raising campaign, to finance the purchase of the site, beautify the property, and as John D. Wilson, president of the West Hants Historical Society and a member of the committee states, "we have plans for a fitting and tasteful memorial to the Acadians, the first European settlers in this country". The committee is urging Acadian descendants such as you who are interested in the preservation of this important site to become members in the organization. As part of a fund raising project. The committee is also selling a 50x70 inch 100 % cotton, two layer color-fast and machine washable "coverlet" in order to raise money for the project. I am grateful to Dr. Donald J. Landry, for having provided me the above-noted article. A Personal Journey to the Newly Discovered Acadian Cemetery of Ste. Famille Parish in Pisiquid, Acadia (Falmouth, Nova Scotia. On August 5, 1996 a regional newspaper, the Nova Scotia, announced a remarkable discovery. A cemetery dating from the 17th or 18th century had been found in Falmouth. Local historians believed it to be the long lost site of the burial ground of the Acadian parish of Ste. Famille, a theory confirmed after careful archaeological assessment. On that memorable August day almost a year ago, I was with my sister, Judy Mire Badeaux of Thibodaux, Louisiana, on the back stretch of a research and sentimental journey to the land of our Acadian ancestors. We had just arrived in what was once known as the Pisiquid area of Acadia, now the Windsor-Falmouth area. There, in the mid 1700's, we have reason to believe our immigrant ancestor, Pierre LeMire, had lived with his family. In 1727 in Pisiquid he signed the oath of allegiance to the English king, George11, and a later marriage certificate states that he was a member of the church parish of Ste. Famille. At that time the only parish of that name, was in Pisiquid. It was precisely that link with the parish of Ste. Famille that had brought us to the town. The registers of Ste. 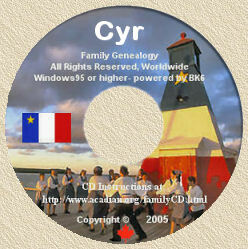 Famille are among the many Acadian records that have been lost. So, while we have no documentary evidence, we surmise that baptisms, marriages and burials of some of our ancestors, probably took place there. My sister and I wanted to have a look around. During a stop at the local historical society to ask the approximate location of the old parish, we heard the exciting news about the graveyard discovery. By afternoon, we were standing on the very site of the graves, talking with archaeologists and with the local builders who had made the startling discovery only shortly before. A few weeks later another sister, Marie Mire of New York, made the same "pilgrimage". While constructing a private home in a subdivision of Falmouth, workers had unearthed bones on the building site. Suspecting that they might be of human origin, the builders contacted the Nova Scotia Museum in Halifax, which sent archaeologists to inspect the find. They discovered not only graves, each topped by a clay cap lying about a foot below the surface of the ground, but also other artifacts dating at least into the 18th century, with some pieces possibly much older; wrought-iron nails, wood fragments, a King George 111 halfpenny and ceramic pieces. The find is significant, being one of the few known cemeteries in the province from the period preceding the 1755 expulsion of the Acadians. Pisiquid (sometimes spelled Pisiquith or Pisiquit), was one of several Acadian settlements established in the 17th century in the Minas basin. The better-known Grand Pré was only a few miles away, also in the Minas basin. The establishment of Assumption Parish, the first Catholic parish of Pisiquid founded in 1698, was followed by that of Ste. Famille, founded in 1722. According to the Hants-Journal article, about 300 to 400 Ste. Famille parishioners may have been buried in the recently found burial ground, believed to have been located adjacent to the church. The discovery posed a major dilemma. Located as it was, on private land, and more precisely in the front yard of an almost completed suburban home, how could it be preserved? On May 7, 1997 the Hants-Journal published an update outlining at least the next chapter of the story. A committee comprising several Acadian and other organizations, has now purchased the cemetery site and will preserve and memorialize it. The committee includes the West Hants Historical Society, la Societé Nationale de l'Acadie, les Amis de Grand-Pré, Hants Regional Development Authority, la Societé historique Acadienne, Les Affaires Acadiennes de la Nouvelle Écosse, Parks Canada and the Municipality of West Hants. The president of the Fédération Acadienne de la Nouvelle Écosse, Barbara LeBlanc, told the journal that the committee's goals is to "preserve this and other rich historic landmarks, build an awareness about Nova Scotia history and create a cultural tourism trail and strategy around these precious historical treasures." The committee borrowed money to purchase the cemetery site, but will launch a fund-raising campaign to carry out the preservation project. For my sister and me, that day last August (1996) was a highlight of an already exceptionally moving trip. The memory is a treasure. In her comments to the Journal, Barbara LeBlanc captured the sentiments of many of us who care about the history and heritage of Acadians: "This will be a momentous occasion for the Acadian descendants, especially those who can trace their family to Pisiquid." Indeed. We await news of further development and even a chance to participate! The above noted is a re-print (with thanks) of article which appeared in the Louisiana Roots Newspaper. There is no charge for this excellent publication and to receive your complimentary subscription, you need only send your name and address to their Subscription Depart, P.O. Box 383, Marksville, LA 71351. Back issues are also available for $5.00 each. Their e-mail address is: [email protected]. The author of the above-noted article, Claire Mire Bettag, CGRS is a professional genealogist now residing in Washington, DC. She and her sisters are natives of Houma, Louisiana.